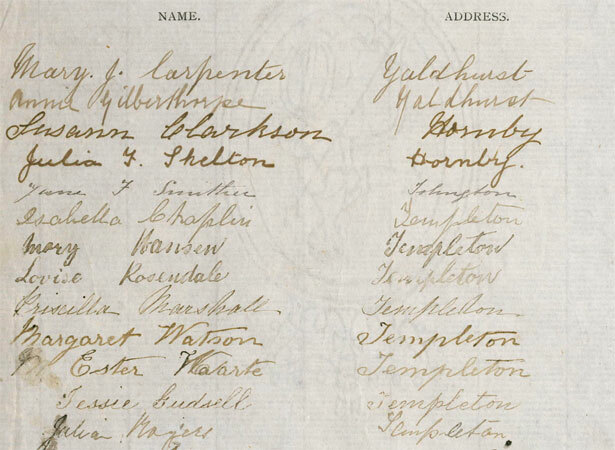 Organised by the Women’s Christian Temperance Union (WCTU), these petitions were signed by a total of 9000 women. They contributed to the introduction of a Female Suffrage Bill, which received majority support in the House of Representatives but was defeated in the Legislative Council (the upper house). Over the following two years the WCTU and its allies presented two much bigger petitions to Parliament. In 1892 their hopes were again dashed in the Legislative Council, but in 1893 women’s suffrage legislation was passed by both houses of Parliament. On 19 September the Electoral Act was signed into law by the governor, Lord Glasgow, making New Zealand the first self-governing country to grant the right to vote to all adult women. We have 17 biographies, 9 articles, related to Women's suffrage petitions presented to Parliament.